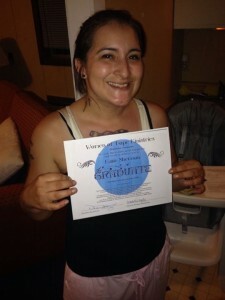 I am 27 years old and have been at Women of Hope since January 27, 2014. My mom left us when I just 1 year old so I was raised by my dad. My dad was addicted to crack cocaine and alcohol for as long as I can remember. My brother, who is 3 years old than me and I were raised in severe poverty; never having enough to eat, never having electricity or running water, living from one abandoned building to the next. By the time I was 12 years old I was smoking pot, drinking and smoking cigarettes daily with no healthy parent telling me I couldn’t. By the time I was 15 I was also addicted to crack cocaine and smoking it with my dad and brother. We were living in one crack house after another. At the age of 15 I was raped by my dad’s best friend and became pregnant with my oldest son and dropped out of school. Later I was able to get my G.E.D. and began to work full time. I stayed clean for about 2 years until I took my first pain pill which was like no high I had ever experienced. I used pills daily just to get through life. When I was 20 I met my husband who was also a troubled youth and addict. I became pregnant with my daughter and we got married. That’s when the abuse started. I was told when I could shower, wasn’t allowed to wear make-up and was locked in a basement for 3 years. The abuse was not only towards me but my children as well. My son suffered daily beatings for the simplest things with belts, paddles or anything he could get his hands on. My daughter was poked and slapped for not going to sleep. When I tried to intervene, I was beaten even worse. I started shooting meth daily with my husband just to cope with the abuse towards me and the children. After years of being locked in a basement, stabbed, choked and beaten someone finally intervened. DCS received a call about my daughter having a black eye and they took my two children into states custody. Then shortly after that I found I was pregnant again and made a decision that would change the rest of my life. I got in contact with Ms. Connie and she accepted me into the Women of Hope. I was 3 months pregnant with Wyatt and 105 pounds. I gave birth to Wyatt while at the Hope House and by the Grace of God there were no side effects of the early drug use, he was perfect. In January of 2015 I suffered a relapse and started talking to my husband again and lost custody of Wyatt. I went back out into addiction for 10 days. The entire time I was gone I had an overpowering sense of guilt and conviction and realized that I had been touched so deeply by God that I couldn’t live that way anymore and this time it was Pastor David who saved my life. He allowed me to return to Women of Hope. Since coming back to Women of Hope I was given temporary custody of all 3 of my children and they were allowed to come back home. Thanks to God’s Grace and Mercy my family was being restored! MOVING FORWARD – On Wednesday, July 15th I gave my testimony for the first time at a Celebrate Recovery Meeting at my home church, Church of the Harvest, Cleveland, Tennessee. 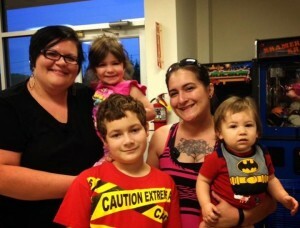 On Thursday, July 16th I graduated Women of Hope AND the Judge granted me FULL CUSTODY of my three children! On Friday, July 17th my children and I along with my mother boarded a Greyhound Bus in Chattanooga bound for Oregon (my family’s home) to begin the next chapter of our lives together – CLEAN and SOBER and praising God!